Neumann University has long since had a history of putting championship caliber teams on the floor, dating back to early PCRHL days. 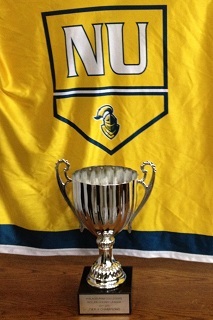 Prior to fielding a national championship NCRHA squad, the Knights had notched back-to-back PCRHL championships in 2001 and 2002. After developing their program to the point of fielding a second competitive team, the Knights managed to repeat their success with another set of back-to-back championships in 2007 and 2008. Since then, however, championship gold had eluded the Neumann squads, despite an overwhelmingly winning record. That would all change on May 6, 2012. The Knights cruised through the regular season this year, dropping only two games: one to Kutztown in the middle of the year and one to undefeated St. Joe's 1 in cross-divisional play. Their playoffs on the other hand, proved that they still had more in the tank, going a perfect 7-0 in pool and bracket play. The Knights dispatched Villanova and Drexel in the first round of pool play, allowing a single goal in the first round. They then did away with Cabrini and Kutztown; two fine teams that combined for a mere 3 goals against the impenetrable Knights' defense. After a "close" 8-4 win over Widener in the semifinals, Neumann had only St. Joe's 2 left to overturn. Game 1 started off cautious with only a single Neumann goal, a short-handed Bill Cunningham tally. But the 2nd period was where the Knights cracked the game open, Kyle Struble scored a pair, sandwiched around an Andrew Scott tally. When Cunningham added a fifth, with only fifteen seconds remaining, it appeared that the Knights would be cruising again. However, St. Joe's proved that they deserved every bit of their championship appearance, outscoring Neumann 2-1 in the 3rd period. John Koch and Dave Tavitian put the Hawks on the board, but they were unable to overcome the Knights' 2nd period. Scott's goal was icing on the cake in a 6-2 victory. In Game 2, the Hawks seemed to have corrected some of their defensive holes from the first game. The Knights would score a "playoff low" 4 goals in this game, however the Hawks could only muster 2 of their own. Chris Applegate and Anthony Parascondola found the back of the net late in the 1st and early in the 3nd, respectively. But both times, Neumann answered back with two goals to the Hawks' one. In the first, Struble buried a shot off of a Scott assist 70 seconds before Scott dished a power play assist to Ryan Haswell. In the third, Maczynski scored another power play goal that proved to be the game winner. Fittingly, Struble and Cunningham put the exclamation point on the championship season, combining for the last goal of the year. Jim Dumont's goaltending proved to be far too much to overcome for any opponent, and the Knights skated away with Tier II championship gold for the first time in league history.